“Really, what we need are new whistleblower protections so that the next Edward Snowden doesn’t have to go to Russia or Hong Kong or whatever the case may be just for disclosing this,” Rep. Massie said. 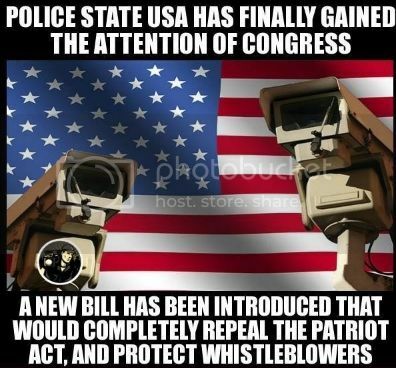 The PATRIOT Act was passed as a fear-based reaction to the events of 9/11 and gave the federal government an unprecedented amount of power to monitor the private communications of U.S. citizens without a warrant. This law is a clear violation of the 4th Amendment, yet it has been allowed to transform our republic into something almost unrecognizable. The Surveillance State Repeal Act would prohibit the government from collecting information on U.S. citizens obtained through private communications without a warrant. In addition, it would also mandate that the Government Accountability Office (GAO) provide monitoring of domestic surveillance programs to ensure compliance with the law. Another section of the bill specifically disallows the government from mandating that electronic manufacturers install “back door” spy software into their products. This is a legitimate concern due to recent comments by FBI Director James Comey regarding legally forcing companies to provide “back doors” to products so the government could potentially access customer data. "The bill would completely repeal the Patriot Act, the sweeping national security law passed in the days after Sept. 11, 2001, as well as the 2008 FISA Amendments Act, another spying law that the NSA has used to justify collecting vast swaths of people’s communications through the Internet." "It would also reform the secretive court that oversees the nation’s spying powers, prevent the government from forcing tech companies to create “backdoors” into their devices and create additional protections for whistleblowers." The bill is looked at by congressional watchers as a non-starter, as there are far too many congressional leaders on both sides of the aisle in Congress that have strong interests in the Military/Intelligence Industrial Complex. A similar bill was introduced in 2013 but didn’t garner any traction as typical militarist talking heads in Congress feigned fear over reforming the nation’s domestic spying operations claiming it would endanger U.S. national security. The time has come for us to utilize social media to create a grassroots movement to end the abomination of the PATRIOT Act and restore our civil liberties! We urge you to voice your support for the Surveillance State Repeal Act to stop unconstitutional spying on U.S. citizens. Please contact your Congressperson and let them know that you want to see the PATRIOT Act dismantled, and you strongly want them to support the passage of H.R. 1466. Joe on Tue, 04/07/2015 - 8:48pm. Perhaps Shock and Awe™ is gradual wearing off, and rationality is knocking on the door? bloggulator on Sat, 04/11/2015 - 1:31am. RL McGee on Mon, 04/13/2015 - 9:36pm. Please make an appointment and ask Walter Jones to reveal what he read in the 28 Pages. There is no national security risk, so he has nothing to be afraid of. If he and the others tell a portion of what is hidden then the jig is up. There will be no reason to keep them classified any longer. The rest of us can then get on with our lives and stop being jerked around by these spineless jellyfish. This is nothing but torment for the families. kawika on Wed, 04/15/2015 - 12:03pm.